FILE - Russian President Vladimir Putin speaks with Olympic Village Mayor Elena Isinbaeva while visiting the Coastal Cluster Olympic Village ahead of the Sochi 2014 Winter Olympics in Sochi, Russia. Russia's sports minister lashed out Tuesday at the World Anti-Doping Agency, one day after a scathing WADA report implicated Russian authorities in an alleged scheme to manipulate drug-testing results for its athletes ahead of next month's Summer Olympics. Vitaly Mutko, a longtime ally of President Vladimir Putin, blasted the WADA, saying "it dictates the [drug] rules, it extends the lists [of banned substances], and it doesn't take care either of the athletes or of their health." He also criticized the agency's independent probe, saying investigators "don't care enough to listen to the defending party." Putin responded in much the same manner Monday, saying the WADA allegations "are built on the testimony of one — a person with a scandalous reputation." Technicians Ilya Podolsky and Natalia Bochkaryova work at the Russian anti-doping laboratory in Moscow, Russia, May 24, 2016. The Russian president was referring to information provided by former Russian Anti-Doping Laboratory head Grigory Rodchenkov to the New York Times earlier this year. He told the newspaper that dozens of Russian athletes used performance-enhancing drugs at the 2014 Winter Olympics in Sochi, with the approval of national sports authorities. 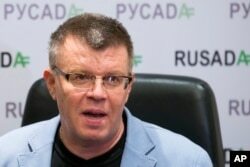 ​On Monday, WADA chief investigator Richard McLaren characterized Rodchenkov's accusations as "widely credible." FILE - Nikita Kamaev, managing director of Russian anti-doping agency (RUSADA), talks to reporters at the agency headquarters in Moscow, Nov. 10, 2015. The report said more than 30 different sports had gained advantages from Russian schemes to manipulate anti-doping rules. It also said it was "inconceivable" that Mutko did not know about those deceptions, and recommended that the International Olympic Committee ban all Russian teams from competing in next month's Olympics in Rio de Janeiro. The IOC, after emergency leadership talks Tuesday, said it is "studying" its legal options before deciding whether to act on the WADA recommendation. The executive board said it is awaiting an arbitrator's ruling Thursday on a move by the International Association of Athletics Federation (IAAF), which banned Russians from the Rio track and field competition. The committee also is reviewing the WADA anti-doping code and the Olympic Charter.